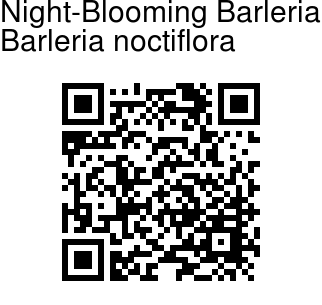 Night-Blooming Barleria is a small undershrub, growing up to 3 ft, with stern much branched, young branches velvet-hairy. Leaves are clustered, oblong or narrowly obovate. 10-18 x 3-5 rum, nearly stalkless, blunt or pointed, with a tiny point, whitish velvet-hairy, later becoming hairless. Flowers are borne singly in leaf axils, bracteolate spines are 6-18 mm long. spinulously branched. Outer sepals are ovate, 13-18 7-10 mm, pointed, spiny-toothed, becoming membranous, prominent nerved, nearly hairless. Flower tube is up to 4.5 cm long. narrow. velvet-hairy outside: petals of limb are broadly obovte, up to 9 mm long. Capsule is up to 1.6 cm long. 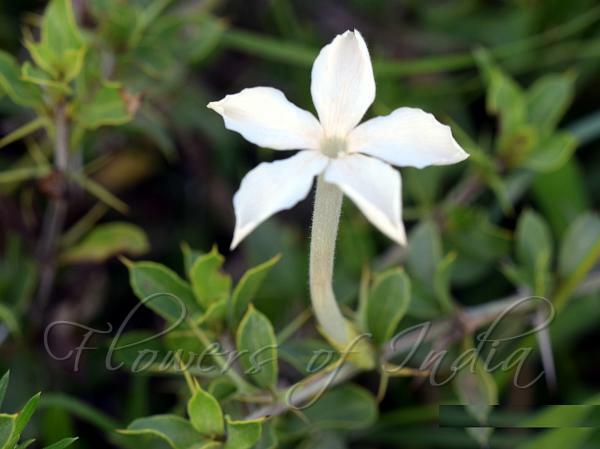 Night-Blooming Barleria is a very rare plalnt, found in the scrub jungles in South India and Sri Lanka. Flowering: December-February. Medicinal uses: Night-Blooming Barleria is being widely used as Folk and ayurvedic medicine, e.g., in treatment of diabetes.